I had a requirement to configure a mechanism within Office 365 to allow pages on an intranet to expire after a set amount of time. When a page has expired the content owner is alerted and a task is assigned to review the page content. A number of content types have been designed and each content type can have an information management policy assigned to indicate the retention period. Connect to the site using SharePoint Designer and create a workflow. 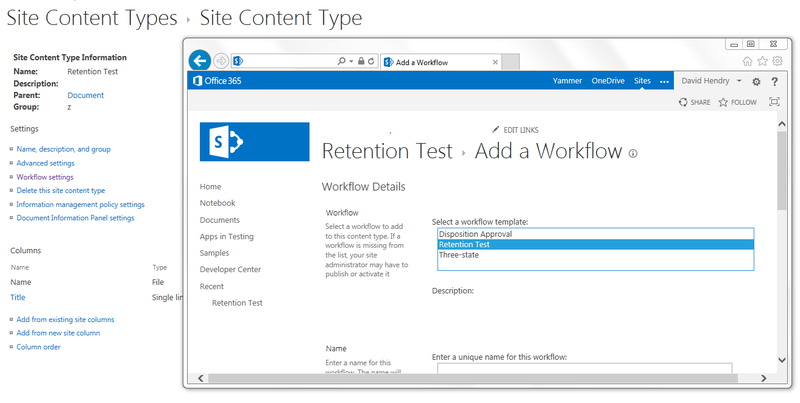 Select the SharePoint 2010 workflow engine as this will allow you to connect the workflow to a content type. This should allow you to select the workflow created in step 2. Configure the action to start a workflow and select the workflow created earlier. Note: After testing in Office 365, we cannot manually start the retention timer job to iterate through the expired items – the timer job runs every Sunday at around 08:30 (in my tenant at least) – makes testing quite difficult, so any testing should be completed in an on-prem environment so the timer job can be manually executed. In our environment we are using Office 365, we configured ADFS / ADFS Proxies / and Dirsync to manage SSO. We have constructed smart links to ensure users are automatically signed into SharePoint when using their work laptop and Internet Explorer – if they are using a difference device / browser then they are directed to the corporate login page. We experienced an issue where customers would be requested to sign into Word / Excel / PowerPoint when opening files directly from SharePoint. Issue experienced in SharePoint 2013, customers were unable to open Explorer view using internet Explorer 10. 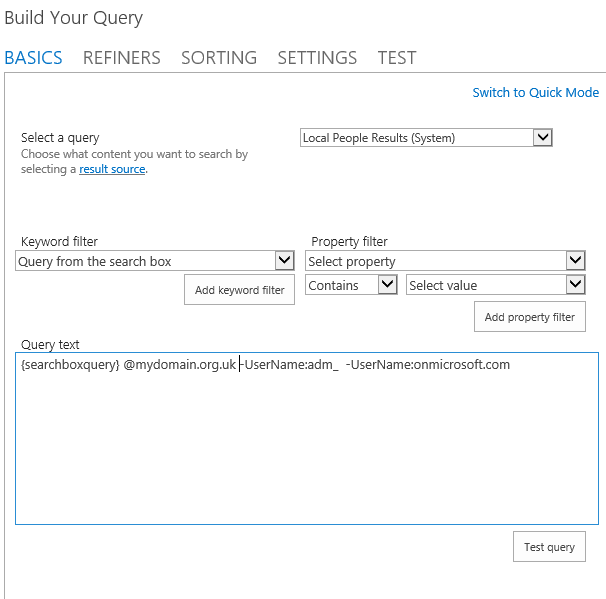 SharePoint automatically creates a query suggestion when users have clicked a search result for a query at least six times. For example, if users have entered the query word “coffee” and then clicked on a search result six times, then “coffee” automatically becomes a query suggestion. Recently came across an issue where there were 3 “David Hendry’s” appearing within people search on SharePoint 2013 / Office 365. So if a user searched for me, they would see 3 ‘identical’ people to choose from. The requirement was to hide cloud admin and domain admin accounts from the search results. I modified the query (shown below) to include the domain name for internal accounts, remove any accounts containing adm_ and onmicrosoft.com. Following scenario is using PowerShell and the Client Side Object Model.. Task: Get a specific Content Type by name rather than ID – as we don’t know what the ID is! Add-LogMessage -message "Adding content type to library"
My issue was that the ‘Search Results Preview’ wasn’t working, in my case this was an easy fix. Solution, Enable the ‘Search Server Web parts and Template’ on the Site Collection level within Central Admin. I had an issue creating the Search Service Application in SharePoint 2013 – my environment is running the baseline 2012 March CU. Unable to retrieve topology component health states. This may be because the admin component is not up and running. I’m sure there are many reasons for seeing this error, I checked all the usual suspects around permissions, firewall etc. In my case, it was because I had modified the NodeRunner configuration file to prevent the amount of memory being utilised by this process. As default, memoryLimitMegabytes is set to ‘0’ – unlimted…not so good on a below spec SharePoint DEV system. My resolution was to restore the original value of ‘0’ – and to recreate the search service app – which worked perfectly. In a previous post I created Outlook appointments using Microsoft.Office.Interop, a limitation of using this method means MS Outlook is required to be installed on the server. To avoid this limitation it’s possible to create an Outlook appointment manually and send as an attachment, you still have full control over the content and behaviour of the appointment file, known as a .ICS file. Dynamically populate the ICS file with content from a custom webpart within SharePoint. Send the email with attachment using the configuration stored within SharePoint (Outgoing SMTP Server, sender address). Ability for the recipient to accept the invitation, to enable the employee calendar to be updated, with no meeting organiser. What the code does… Creates a new instance of MailMessage, specifics the SMTP Server, Sender Address, and a couple of other properties. P.S. I’m not managing garbage collection within this area of code..Also the variable ‘appointment’ is a class that I created to store the variables from the SharePoint webpart. The next part builds the ICS file as a string. I found these properties by sending meeting invitations to my Gmail account and opening the appointment file in Notepad to understand what parameters I required. I couldn’t use the send mail functionality available in SPUtility as I was unable to add attachments, there may be better ways of sending the actually email with the attachments. Recently came across a scenario using SharePoint 2010, Duet, and SAP. The scenario being when submitting data to SAP from SharePoint any Date/Time fields would be stored in SAP using the local time of the user whom submitted the data. However when the data is sent back to SharePoint, the Netweaver layer converts any Date/Time fields to UTC time. After a little research found some very useful information on MSDN that handles the conversion of UTC time to local time based on the regional settings of the SPWeb.